TLT2 Versatile Tracked Robot. The TLT2 and TLT2-F Tactical Surveillance Robots are our best selling tactical solutions. They are a perfect balance of size, speed, weight, mobility/maneuverability, and capability. The TLT2-F was qualified during a series of NIST tests. The TLT2 is capable of climbing household stairs and obstacles. The TLT2-F includes rear flipper/stabilizer arms, which are used to lift the robot’s nose onto high obstacles. They also act as a stabilizer to prevent roll over on steep pitches. With the rear Flipper/Stabilizer arms the TLT2-F is capable of climbing aggressive stairs and obstacles. The robot package includes the TLT2 or TLT2-F, a selection of a custom remote and the selection of a front tilt camera. Other accessories include, lights, audio, backup camera, and a storage case. Speed: 0 to 5 ft per second, infinitely adjustable/controllable. Dimensions: Total height: ~7 inches; Total width: ~18.625 inches (16.5″ width without rear flipper/stabilizer arm); Total length: ~27 inches; Ground Clearance: ~2″. These robots are built to order. Please allow 3-8 weeks for delivery. 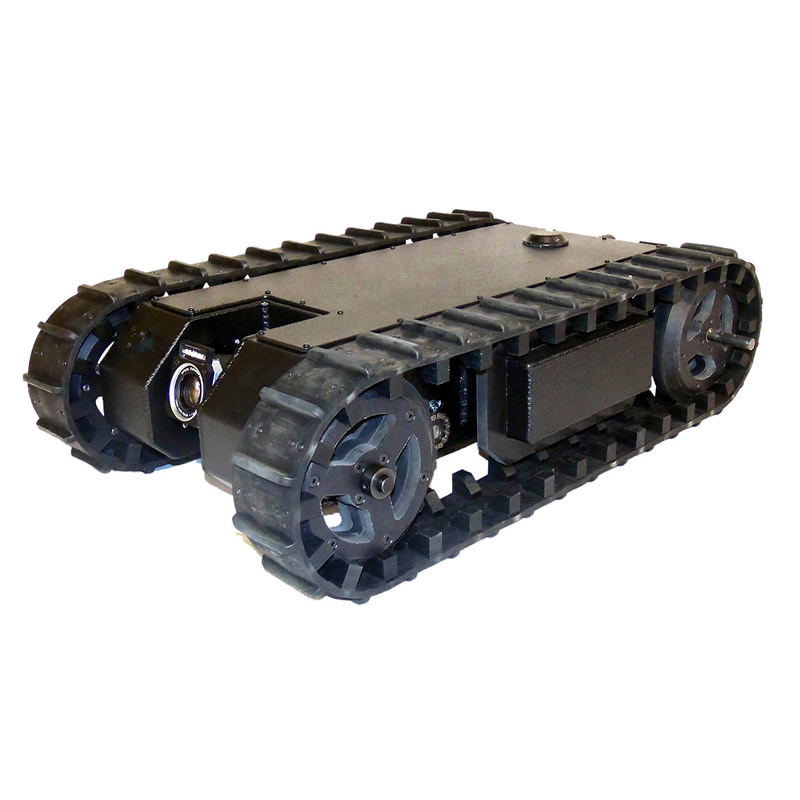 Low Clearance Inspection – Weatherproof chassis designed to go where other robots can’t i.e., under most vehicles, beds, or other hiding areas etc. Mid-Sized Tracked Robot for climbing stairs and obstacles – The tracked design allows this robot to climb over most obstacles and go up and down most stairs. Remote Surveillance – The tilting IR camera allows the viewer to see everything even in the total darkness. The tilt camera can be upgraded to a 27X optical zoom low light camera. Hostage and hazardous surveillance – Survey hostile/hazardous situations staying out of harm’s way. Clearing rooms remotely – Clear rooms and buildings remotely with audio and video surveillance. Select the plan the best meets your needs below and we will provide a detailed quotation. All the plans can be customized by selecting different options. The quote form provides you with the ability to comment and add any additional features such as HAZMAT sensors, secondary monitoring stations/repeaters, tethered control, etc. Please contact us if you need any help or have any questions/comments.